Rosacea at LAB Skin Clinic, Neutral Bay, Call 02 9909 3602, is a common chronic and progressive, micro-circulation, inflammatory skin disorder that results in persistent redness, dilated capillaries, congestion, and quite often papules and pustules. 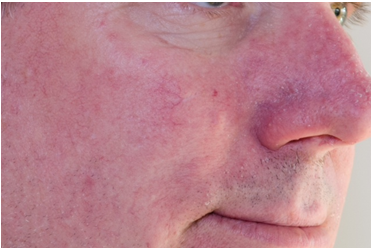 If improperly addressed, rosacea may eventually lead to permanent skin damage and disfiguration. Its origins are genetic – often appearing in early in children with a tendency to blush or flush easily. Left untreated, rosacea will become worse. Ageing causes redness to spread beyond the nose and cheeks to the forehead and chin and sometimes the ears, chest and back can be affected. So, to ensure you intercept this problem early, make an appointment for a complimentary consultation by calling 02 9909 3602 or by clicking on the link below. 3. Phymatous (Rhinophyma): the skin thickens and has a bumpy texture. This sub-type is rare. 4. Ocular: affects the eye. If rosacea affects your eye, you may need to see an ophthalmologist. Left untreated, rosacea will become worse. Ageing causes redness to spread beyond the nose and cheeks to the forehead and chin and sometimes the ears, chest, and back can be affected. Doctors and dermatologists mostly rely on anti-biotics to control certain populations of micro-organisms that can worsen the condition such as the parasite demodex folliculorum within skin follicles and or helicobacter pylori bacteria at the digestive level. This is, at best, a temporary solution, which does not resolve the condition. Our treatment objective is to eradicate the visible signs and help clients to control outbreaks and halt progressive deterioration. This is successfully achieved using gentle skincare products that are natural, non-chemical-based integrated with diet, nutrition, and lifestyle modifications, supplementation, and technology treatments. For an accurate diagnosis and treatment program, call us on 02 9909 3602 or make an appointment by clicking on the link below.